Step back into the early 1800s, into Almack's fashionable Assembly Rooms in London. The evening's festivities are well underway, and the dancers are in position, awaiting the music. Prepare to honor your partner to the opening strain, as the orchestra is about to begin! These are the days of Jane Austen and John Keats, Lord Byron and Beau Brummell, of Lord Nelson and Napoleon, and the setting for "Master and Commander" and the Regency novels of Georgette Heyer. Selections from this recording can be heard in Bright Star, the romantic movie about poet John Keats. Jane Campion's time capsule of the Regency Era uses Spare Parts as the orchestra heard in the big dance scene. Listen for "Sussex Waltz" in the dance, and "Bonnie Highland Laddie" in the background as Fanny and John leave the ballroom. Check out the New York Times movie review and trailer. This elegant music is played by Spare Parts, a group specializing in dance music from many eras. 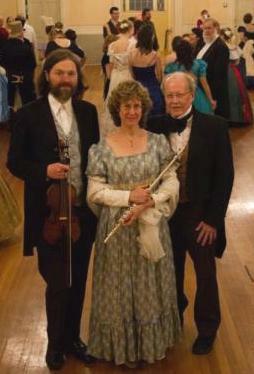 Liz Stell (flute), Bill Matthiesen (piano) and Eric Buddington (violin) win praise for historical accuracy and for bringing lively dance energy to all their performances. Learn more about the dances of this period from Susan de Guardiola's informative articles, What Did Jane Austen Dance? and What Did Regency-era Dancers Dance?